Thank you, your letter has been sent! Cher, Liberals need to get some cash after wasting many billions of dollars at various scandals. 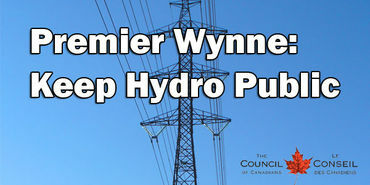 I am OK with private Hydro, as long as the deal is transparent and fair. Yesirree! At least this way Hydro it seems to me to have some competition? I would rather go solar, wind mills & growing crops for fuel. Things like that I would like to see every second electricity pole be replaced with a wind mill . Let's start like that!